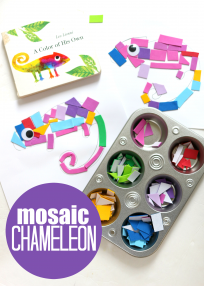 Creating two activities with the same materials for two very different abilities is one of my favorite challenges. 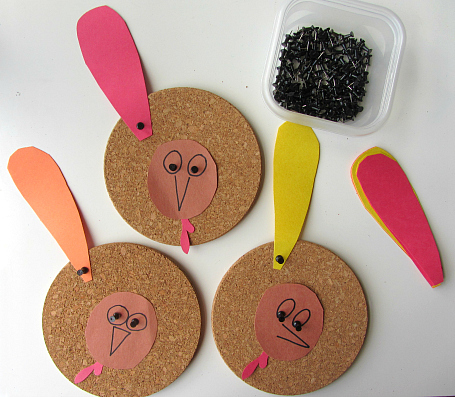 These turkey cork boards made it simple. My daughter matched colors and naturally counted the feathers upon completion. 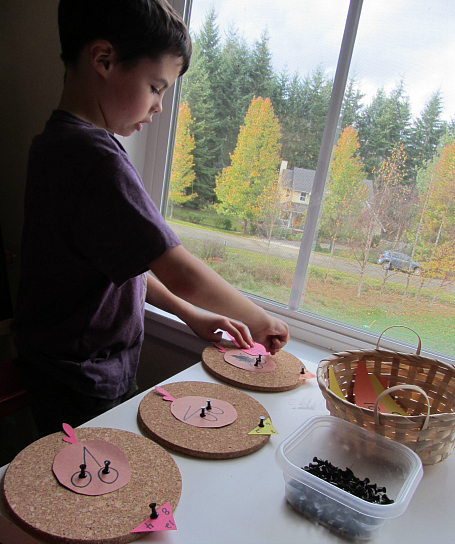 My son loved the fact families and the novelty of using thumbtacks made it all the more fun. 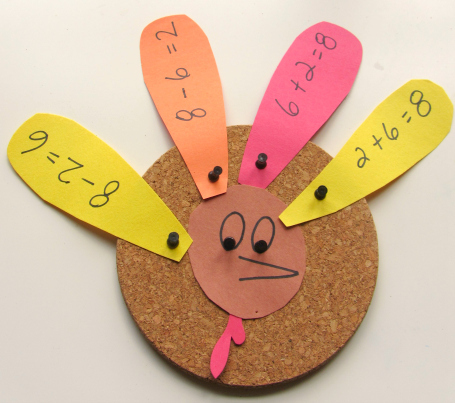 This Thanksgiving math activity was a huge hit at our house! Gather your materials. 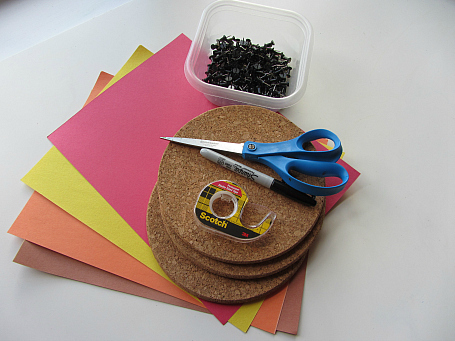 You will need some cork boards ( I got all three at IKEA for $3 ), construction paper , double stick tape, marker, and thumbtacks. 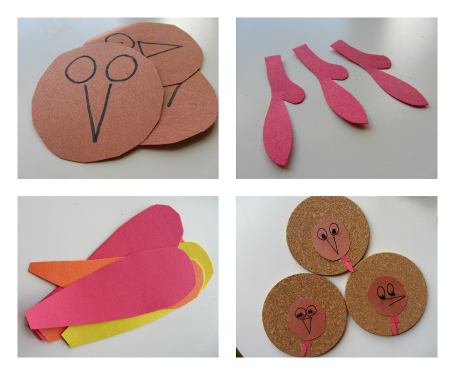 Start by cutting out circles for the turkey’s heads , feathers, and wattles. 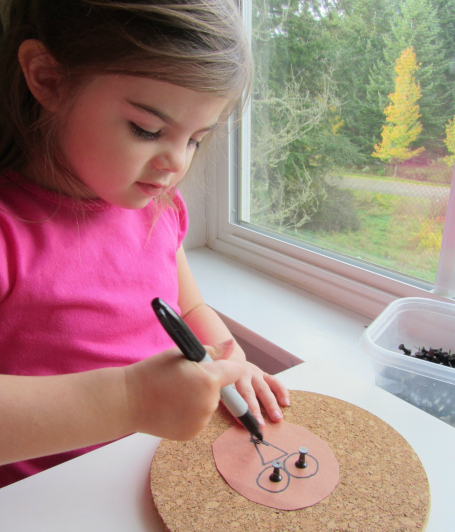 Draw a simple face ( I made the eyes big enough to use thumbtacks as pupils), and tape the wattles on. Tack the heads on. 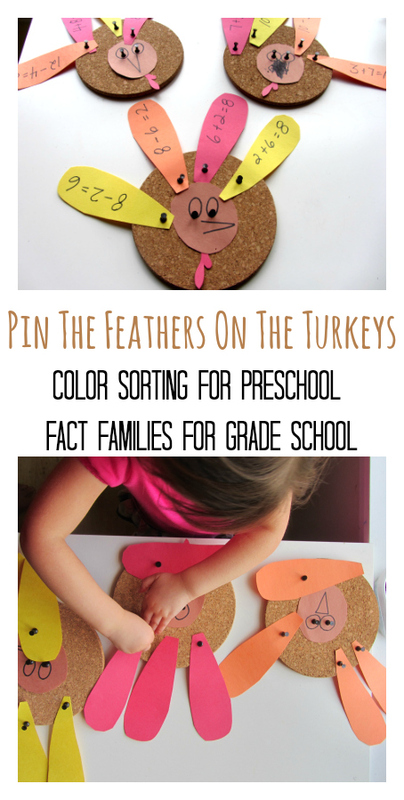 I tacked one feather on each turkey as a guide for my daughter and invited her to tack the rest on. 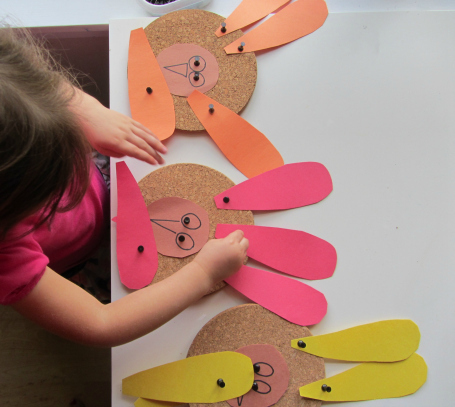 She made a yellow rabbit and two turkeys ! 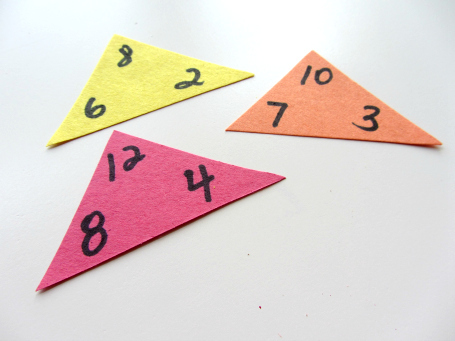 I added a small fact family triangle as a guide and tacked them on. While my daughter colored in one of the turkeys to make it just right! 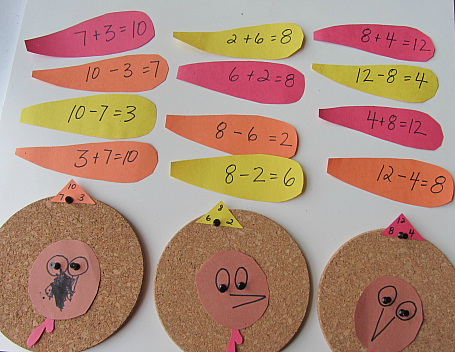 Wrote out the fact family number sentences on the feathers. 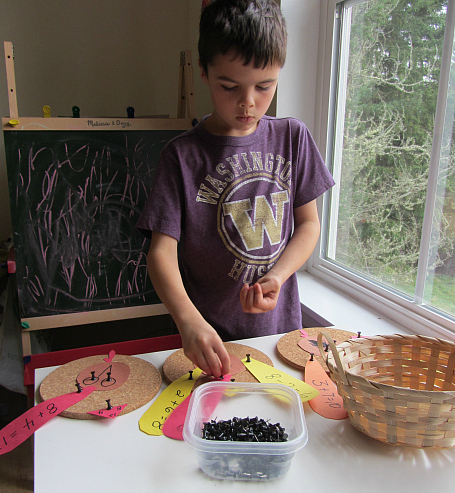 I invited my math whiz and he jumped right in to pinning the feathers. I did not keep all the fact families on the same color feathers because I did not want him to simply match the colors. 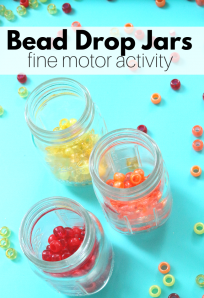 This activity could be adapted to any math ability. 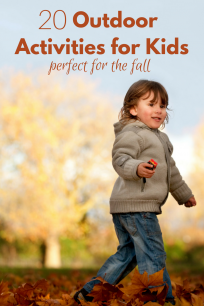 You could match numbers, match digits to tally marks , do odds and evens… they sky is the limit! 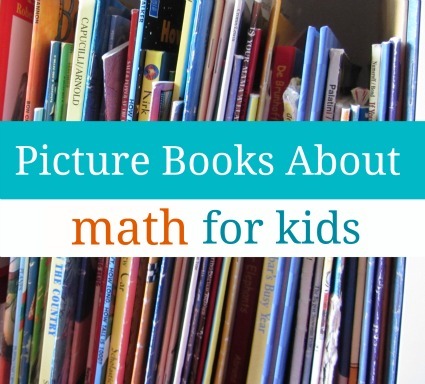 Check out our books about math for fun counting books and more for kids! My son is a little older (3rd grade) so I would take out one of the numbers and replace with “X”. He would love that! Great way to learn. Good article.